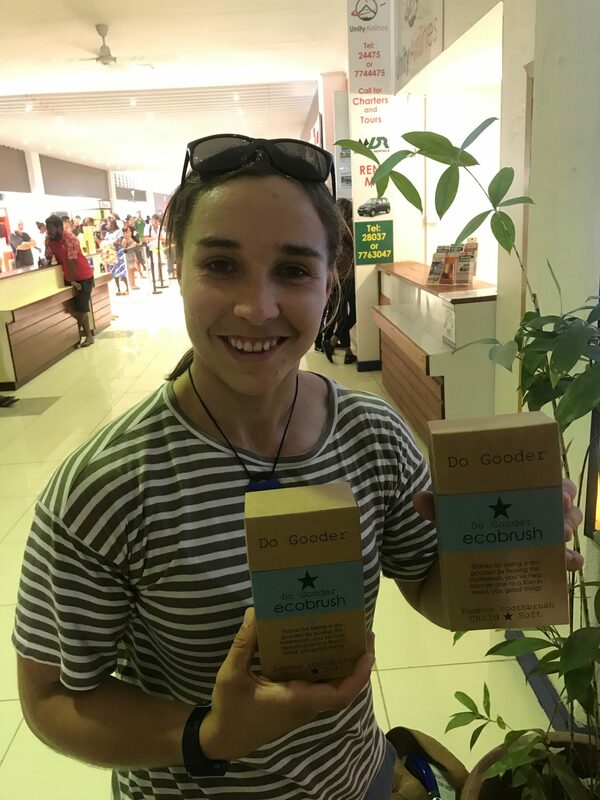 Katherine Dobie pictured arriving at Port Vila airport with some of the 252 Do Gooder Eco Brushes she and her colleagues at Sky Sports in New Zealand have donated to the Butterfly Trust dental programme. The toothbrushes were provided at cost by Do Gooder. As well as donating the toothbrushes Katherine also helped transport a large number of reading glasses in her baggage. 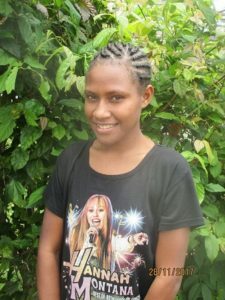 Isobel Obediah and Marienna Nambong, 2 students from the Maskelyne Islands, have each been awarded Vanuatu government scholarships to study at university in Fiji. We congratulate them on the hard work, diligence, and scholastic ability they displayed in achieving this recognition. Isobel and Marienna were pupils at Sangalai Centre School on the Maskelynes before going to secondary school. Each year, throughout their secondary school years, they were both worthy recipients of Butterfly Trust school fees subsidies and scholarships. Thank You Auckland City Football Club! Brian Kaltack (2nd from left), Micah Lea’alafa (2nd from right) and David Firisua Jr (far right) with Dave and Lynn from the Butterfly Trust on a cold and windy October day at Kiwitea St.
Auckland City Football Club has again provided valuable support to the Butterfly Trust. On 14 October 2018, we set up a stall at Auckland City’s home ground at Kiwitea St in Mt Albert, Auckland. Auckland City’s supporters gave donations generously during the afternoon and at halftime, Ivan Vuksich, Auckland City’s chairman, presented us with a range of football gear to distribute to outer island football teams in Vanuatu. At the end of the game against Team Wellington (which Auckland won 4-3) Ivan then presented the Trust with a substantial cheque from the day’s gate sales. Thank you once again Auckland City! At the end of the game we also had the pleasure of meeting Brian Kaltack, captain of the Vanuatu Football Team, who plays for Auckland City. 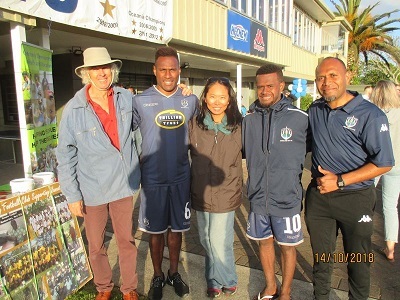 It was great to chat in Bislama with him and Solomon Islanders Micah Lea’alafa (player) and David Firisua Jr (special projects manager). We have been lax at updating the sailing log. We apologise. 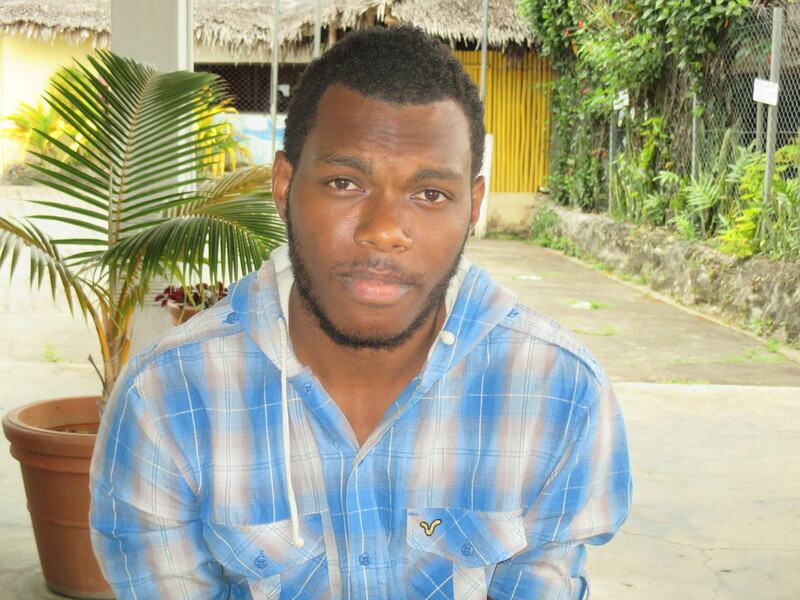 We have been more focused on the operations of the Trust than recording the life of Rireana. So set out below is a brief summary of the last two years. In June of 2016, we sailed Rireana to Noumea in order to finish off the repairs made necessary by Cyclone Pam. We hauled out at the Neptune Boatyard in Baie de Numbo and were very lucky to find Al and Asa Chipman there who are experts in wooden boat work. 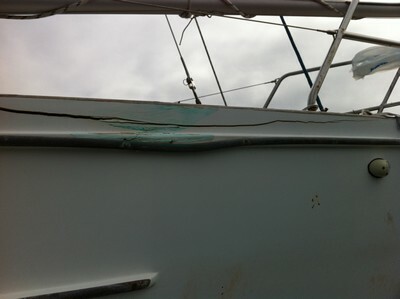 Al finished the repairs and also made some upgrades to an excellent standard of workmanship. We would like to thank him and Asa for their generosity to the Trust and also to us personally. 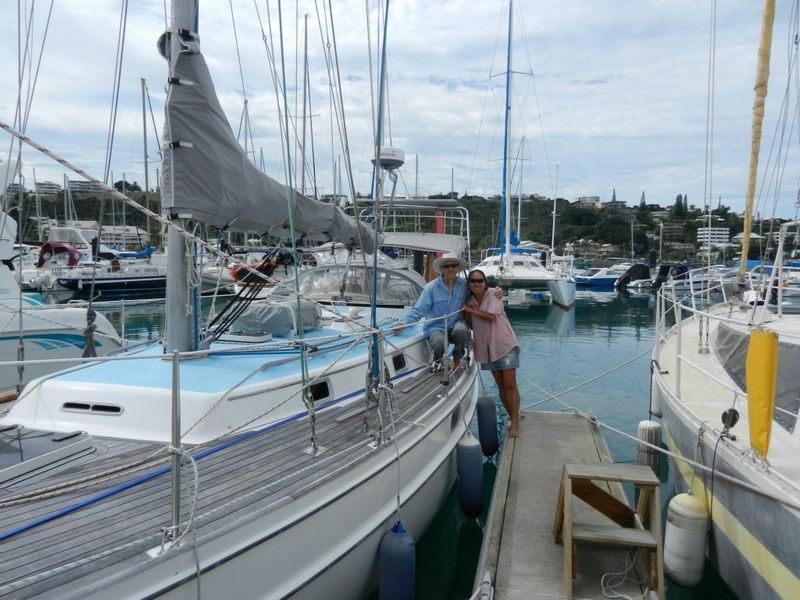 We were in Noumea for about two and a half months before sailing back to Vanuatu to continue the work of the Trust. For the 2016/2017 cyclone season, Rireana was on her usual mooring in Port Vila harbour. Luckily there were no major cyclones and she came through safely. In May it was then back out to the islands for a “tour” of the Trust’s programmes in Epi, Malekula, the Maskelynes, Akhamb, Ambae, and Tongoa. Tongoa is an exposed anchorage and with the weather against us, we had to sail past. Lynn subsequently flew back there to attend to the work. For the 2017/2018 cyclone season, we sailed the boat back to Noumea in December 2017 and hauled out at Neptune again where Rireana was securely lashed down. Keeping Rireana in Vanuatu during the cyclone season is difficult and not as secure as New Caledonia. We also used the opportunity presented in Noumea to ask Al and Asa to help with some more upgrades to Rireana which they again did with great results. It is now June 2018 and we have sailed back to Vanuatu and up to the island of Espiritu Santo (commonly called just “Santo”). We often use this island as a replenishing base. This time we also have the excellent services of Pete Wederell of Total Marine Solutions who has installed a watermaker for us (as well as fixing a leaking injector pump). Pete is a long-term supporter of the Butterfly Trust and we thank him for his continued goodwill and generosity. As to what happens now we are unsure. 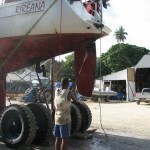 Rireana’s insurers have changed the rules for cyclone seasons such that she can no longer remain on a mooring but must be hauled out. We also need to rebuild the engine so we are currently looking at options. It could be here in Santo under Pete’s supervision, it could be Australia, it could be in Noumea again. We re-joined Rireana in early March 2014 in Port Vila where she had spent the previous 3 months on a cyclone mooring. 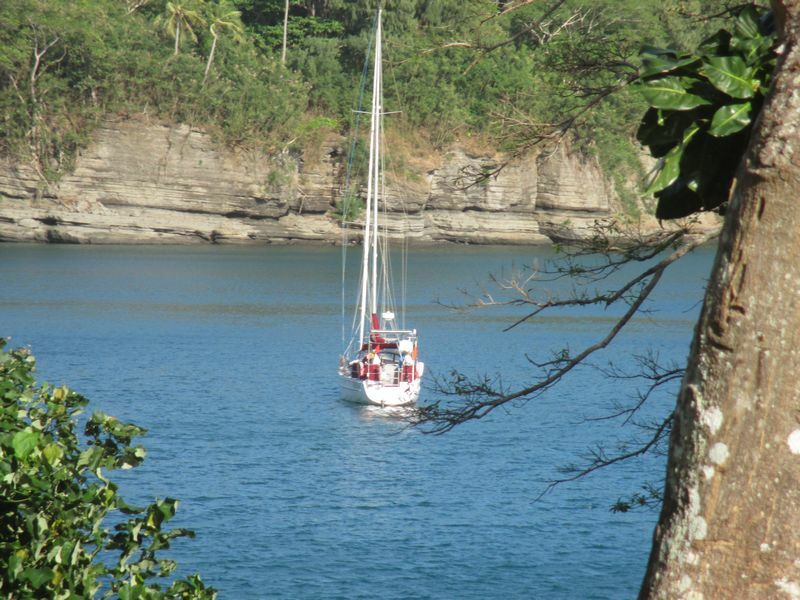 After working in Port Vila we set sail for Noumea, New Caledonia, in early May. 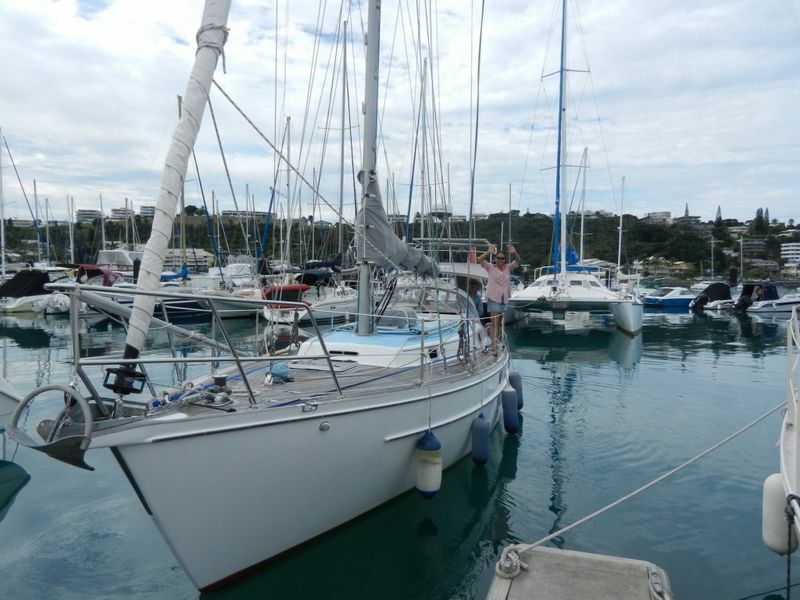 Our purpose in going to Noumea was to haul the boat out of the water for maintenance. We had one of our best ocean voyages, travelling south with a 12 knot easterly on the first day, sunny skies and a slight swell. We took advantage of the conditions to make as much easting as possible and managed to make a landfall at Williams Bay (previously Dillon Bay) on Erromango just after sunset. This was a bonus – another gentle night at anchor. The next day the sea was beautifully calm with a gentle breeze from the ESE and we sailed serenely off towards Havannah Passage at the southern end of New Caledonia. We sat on the foredeck eating lunch and enjoying the smooth waters, something we had very rarely experienced in the open ocean. Another balmy night and day followed and while progress was not scintillating, the peacefulness more than made up for our reduced speed. We approached the island of Tiga as sunset fell and the breeze dropped, so for the last night it was on with the engine and we reached Havannah Passage as the sun rose, with a couple of light showers thrown in for good measure. The entrance through the passage was uneventful and we anchored in Port Boise for a sleep before heading around to Noumea the next day. 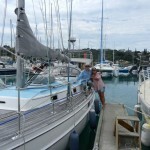 In Noumea we hauled the boat out at Nouville Plaisance. This was akin to boating heaven after spending the last two seasons in Vanuatu. We were spoilt for chandlery and all things necessary to keep a yacht sailing. Our good friend Ian Hyde-Hills (the builder of Rireana) came up to join us and helped with the work on the boat. 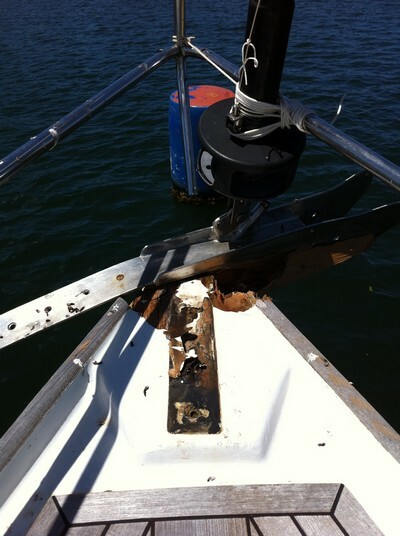 His expertise is second-to-none and it meant we could do things, such as replacing through-hull valves and the depth sounder transducer, with full confidence in the integrity of the work. We also replaced our anchor winch with a new Maxwell RC10 and have not regretted it. 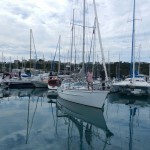 After doing the routine work such as anti-fouling, we launched and spent a few days in the marina at Port Moselle waiting for a suitable weather window to return to Vanuatu. While in Noumea, as well are being helped by Ian, we received much assistance from our New Caledonian friends, without whom our visit would not have been as enjoyable or successful. Merci beaucoup to Raymonde, Jose and Jacqueline, Remy and Claudine, Eric and Anne-Marie, Christian and Elizabeth and Alex, Stefan and Caroline and Nemo. We left Noumea with a spring in our mast-step and departed the Havannah Passage in a light to moderate south-easterly breeze. This continued for the first two days but on the third became more easterly and strengthened to 20 to 25 knots. We put two reefs in the main, furled most of the genoa and bounced all the way to Port Vila with large swells breaking on the beam. 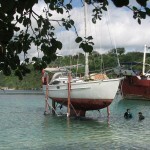 The rest of the season was spent sailing around Vanuatu. 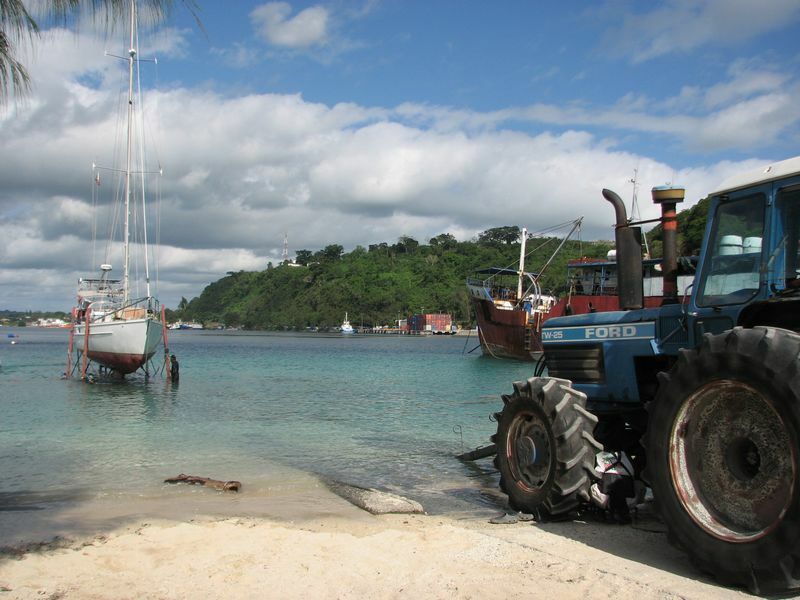 Our work took us to southeast Malekula, up the west coast of Malekula to Santo, from Santo to Ambae, and from Ambae to Tongoa (sailing down the east coast of Ambrym) and back to Port Vila. A second trip took us back to southeast Malekula and then back to Vila. We experienced a surprising number of north-easterly winds, especially when we were sailing north, and so the season was characterised by reefed sails and water over the decks as we sailed to windward most of the time. In fact, we kept two reefs in the main for about 6 months, not even bothering to shake them out when we anchored. The head winds plus the triangulated seas around the islands of Vanuatu made the sailing challenging, especially around the passages between Maewo and Pentecost, and Pentecost and Ambrym, where the tide and wind produced large seas. After our last return voyage to Port Vila in early November, we again put Rireana on a cyclone mooring and are now keeping a weather eye on the forecasts. We launched Rireana at the end of the cyclone season on 30 April 2013. We had spent the previous 6 weeks preparing her for another season of work in the tropics. 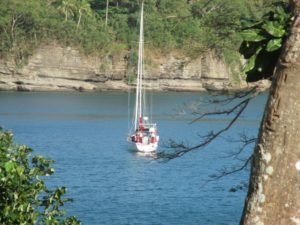 After launching we proceeded to a mooring in Port Vila Harbour and lived and worked there before heading north to Malekula at the beginning of June. We stopped at Havannah Harbour and then, because there was an onshore wind causing a rough sea at Revolieu Bay on Epi, we proceeded directly to the Maskelyne Islands and entered Sangalai Harbour in the dark. Modern chartplotters are wonderful things. 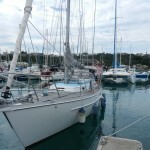 We then spent a couple of months sailing between the Maskelyne Islands and Port Sandwich while attending to Trust work. 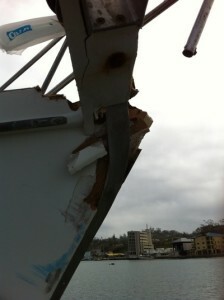 There were the usual issues with strong winds in Sangalai Harbour but our anchor held. 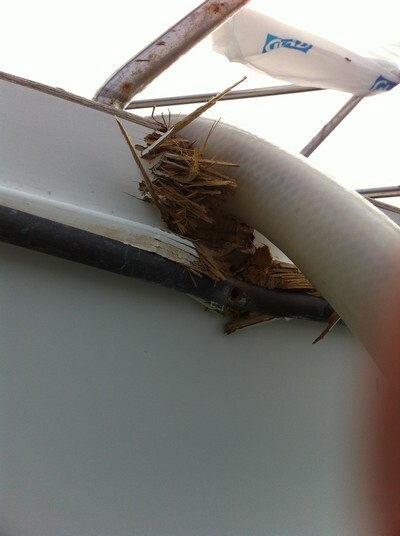 We also experienced a rough couple of nights in Avock but again, the anchor held well. Each passage into Port Sandwich also seemed to be accompanied by strong winds, rain, and falling darkness. We left Port Sandwich and returned to Port Vila in August, battling a 20 to 30 knot south easterly at first, which slowly, and luckily, went more easterly as we sailed south. We took as much water over the deck as we have ever done, but made a relatively fast passage, reaching Havannah Harbour in about 15 hours. 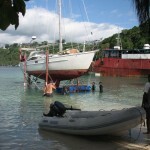 We worked in Port Vila until the beginning of September when we again sailed north to Malekula. Our passages were again, relatively uneventful. On the return voyage to Port Vila in early October we made an overnight stop at Lamen Bay on Epi, and another at Revolieu Bay. 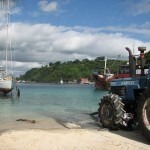 We again made the decision to leave Rireana in Vanuatu for the cyclone season. However, this year, instead of hauling her out of the water, she is on a cyclone mooring.